The English Reports Full Reprint in HeinOnline contains two index volumes that contain an index of cases from A to K and L to Z. 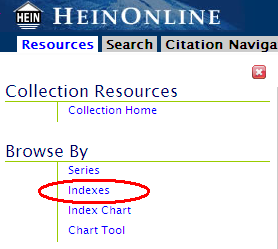 These indexes can be accessed and browsed by clicking on the “Indexes” option from the Resources menu. Or, using the Advanced Search option in the English Reports library you can build a search that will look for a case across a specific letter from within the index. We’re going to focus this week’s tip on how to build this search and then quickly pull up the case you are looking for. The table of contents in the English Reports Library now displays the nominative citation for each case listed. This enhancement will make it easier to identify the beginning page of a specific series of nominative reports within a volume. This is especially useful if you often use the Chart Tool in the English Reports Library. Let’s take a further look to see exactly what this means. 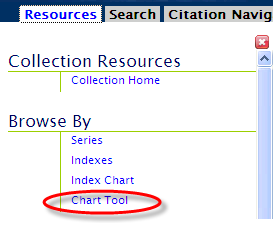 From the English Reports Library, click on the Chart Tool found under the Browse By options in the left menu.